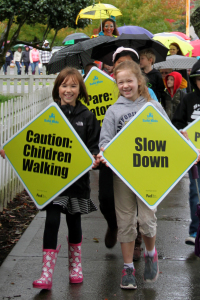 The Washington State Legislature continues work on a transportation funding package that includes funding to create a safer walking and biking environment for school children. Now that the House and the Senate have passed their respective budget proposals, critical negotiations are underway between the two bodies. While the Senate version essentially maintains statewide funding for Safe Routes to Schools (SRTS) at current levels, the most recent House proposal would increase funding to $236 million over 16 years. Since its inception in 2005, the SRTS program provides technical assistance and resources to school districts and local agencies for efforts to encourage more children walking and bicycling to school safely. The program funds small-scale infrastructure improvements such as sidewalks, traffic calming, and enhanced pedestrian crossings. In addition, it assists municipalities to enforce school zone safety through efforts such as crossing guards, neighborhood watch programs, vehicle speed feedback signs, and law enforcement assistance. It also funds school-based education and encouragement programs such as the Walking School Bus. The need for this program has never been greater. Today, only 13 percent of America’s children walk or bike to school, down from close to 50 percent a generation ago. Lack of physical activity has a potentially terrible impact on children’s health, including increased rates of obesity. When children can safely walk or bike a mile to school, they can meet two-thirds of the daily recommended amount of exercise. Studies also show that children who walk and bike to school concentrate better, which increases academic performance. When more children walk or bike to school, more parents drive less, ultimately reducing congestion, improving air quality and supporting community engagement. Currently, only one in four proposed SRTS projects are funded. With a modest increase in funding, we can enable more locally-driven school safety projects to reach completion. Please take a few moments to thank legislators and ask them to support the House proposal’s investment levels for biking and walking.